Adoption of new technologies depends significantly on whether potential users are willing to pay a premium for the associated benefits. A new study explores farmers’ willingness to pay for drought tolerance (DT) in maize, a crop playing a leading role in the food security in southern Africa. Focusing on Zimbabwe, this research aimed at estimating the implicit prices farmers would be ready to pay for this trait compared to other preferred traits, such as, for example, grain yield, cob size, and texture. 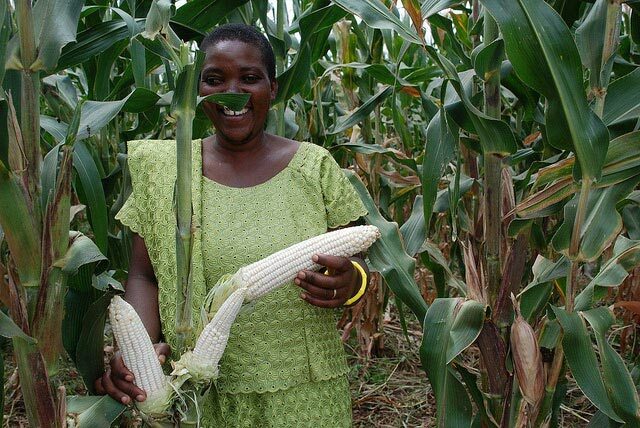 Tanzanian farmer holds drought tolerant maize cobs. Photo credit: F. Sipalla/CIMMYT. Drought is a widespread phenomenon across Africa south of the Sahara with an estimated 22% of mid-altitude/subtropical and 25% of lowland/tropical maize growing in regions affected annually by seasonal water shortages. Climate change is likely to increase average temperatures by 2.1 °C in the region, which will lead to even greater water scarcity, particularly in Southern Africa, in the coming decades. Studies have indicated that an increase in temperature of 2 °C would result in grain yield decreases by 13-20%. For every day with temperatures above 30 °C, yield is reduced by 1% under normal conditions and by 1.7% under drought conditions. There is evidence that the use of new crop varieties, such as drought tolerant maize and improved management techniques can offset yield losses by up to 40%. While the development of these new varieties and related technologies is laudable, their impact depends very much on the extent to which they are adopted by farmers. This study was conducted across all geographical districts of Zimbabwe and included 1400 households. It finds that farmers in Zimbabwe are willing to pay a premium for drought tolerance equal to 2.56, 7, 3.2, and 5 times higher than for an additional ton of yield per acre, bigger cob size, larger grain size, and covered cob tip, respectively. It also finds that women are more interested in DT than men. The authors suggest that this might be due to women’s higher sensitivity to the risks associated with food shortage and a higher relative risk aversion in general. Among other interesting findings, households headed by those engaged in temporary employment to supplement their livelihoods are more interested in drought tolerance in maize compared to those headed by farmers. Based on their findings, authors recommend that marketing campaigns emphasizing the value of the new maize cultivars should be tailor made with the identified and most enthusiastic interest groups in mind. This will enable faster dissemination of the new technology. Read the full article and watch the summary presentation by the authors. Open Access funded by the Bill & Melinda Gates Foundation.